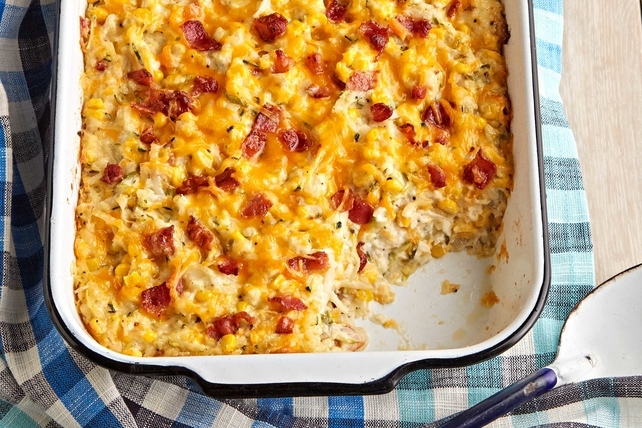 Easily feed a crowd with our Fresh Corn, Hash Brown & Zucchini Casserole. One hour is all you need for our Fresh Corn, Hash Brown & Zucchini Casserole. Reserve 1/2 cup cheese and 1/4 cup bacon for later use. Combine remaining cheese and bacon with remaining ingredients. Spoon into 13x9-inch baking dish sprayed with cooking spray; top with reserved cheese and bacon. Bake 40 to 45 min. or until heated through. Let stand 10 min. before serving.